I've been making my lip balms with macadamia oil and beeswax (peppermint, lavender and honey flavours), but in winter, they just aren't strong enough! I get really dry and sore lips in winter, so I need a heavier soothing lip balm for cold and windy weather. I decided to try this recipe from The Nerdy Farmwife for a soothing chamomile lip balm. It uses chamomile infused oil (I used olive oil) and castor oil (which is heavier than macadamia oil) and peppermint essential oil. The chamomile is soothing, while the peppermint gives you a nice tingle like blistex. I have been trying to grow chamomile, but no luck so far, so I used dried chamomile (actually it was pure chamomile tea from Tea2). Making an infused oil is very easy. Just put your herbs in a jar of oil and leave them for a few weeks, then strain out the herbs. For my herbal salve I use comfrey, chickweed and calendula petals. Other herbs that are good for skin include borage, yarrow, gotu kola, violet and lemon balm. (See posts below). 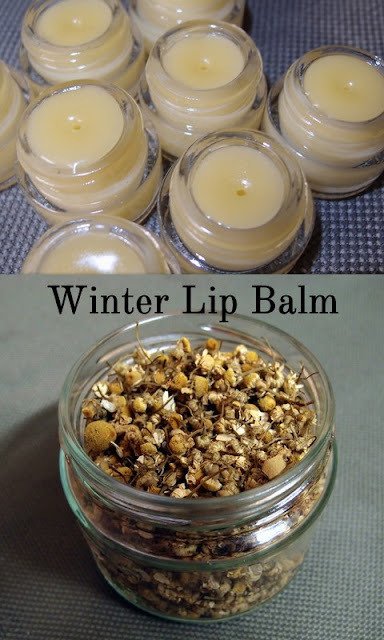 I have a limited number of winter lip balms available in my Etsy shop, as I made more than I needed, so I'll see if they end up being popular. What do you think? Do you need a stronger lip balm in winter? I have had no luck with growing chamomile either, Liz. No idea why! Your lip balm looks lovely. I have managed to source some beeswax from Mt. Cotton and would like to have a go at making my own creams and balms too. I need much better lip balm in winter. I think chamomile need more regular water and cooler temps that QLD has it used to grow like a weed for me in NZ.